Violence has subsided in Kingston, Jamaica, but the mood remains tense, residents said Wednesday. (CNN) -- There's a post-9/11 atmosphere in Kingston, Jamaica, local residents say, after a failed police assault on the stronghold of a suspected drug kingpin wanted by the United States. "The daytime really isn't a problem, but the night can be. Your rights are reduced after 6 p.m. The police can stop you for virtually any reason. It's a similar situation to after the September 11, 2001, terror attacks in the United States," one Kingston florist told CNN. "You are more cautious because you know what's going on, but it's not like you can't come out of your home. ... It's not like you can't go out, but it could be more of a hassle if you do," she said. Police moved earlier this week to arrest Christopher "Dudus" Coke, a suspected drug lord. 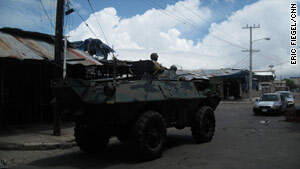 They were met with violence that has left at least 29 people dead, including police, a soldier and many civilians. The government said Wednesday that more than 500 people were in custody. Some people, however, were attempting to get back to business on Wednesday. "I think by now most people have started to get over the initial shock," iReporter Jason Alliman told CNN in an e-mail. "Most schools are in session, exams are still being held, businesses have started to reopen. People are still a little tense about the whole situation, but I think that's due more to uncertainty about what will happen next than [the] actual threat of violence." But the florist believes the violence could go on for weeks. "That's unnerving because everything's being drawn to a standstill. Business was already bad before this because of the recession. Now it's come to a standstill," she told CNN by phone from Kingston. The florist said she thinks the government could have moved sooner against Coke, possibly avoiding the situation it now finds itself in. "The government's trying to fix the problem, but it didn't have to reach this point. They could have dealt with this earlier," she said. At the moment, the violence seems mostly to have passed, but many people still do not dare to go out, they said. One resident of nearby Port Royal said by telephone that people are staying out of Kingston -- even failing to show up for work or school -- because they do not want to get caught in violence. "I can't venture to town. I have business that I need to take care of," said the man, adding that there are no banks in Port Royal. The man said that at the restaurant where he works, business is down "99 percent for the past four days," since the violence began. People can get essentials in Port Royal, but many go into Kingston to shop, he said, declining to give his name. At St. Andrews High School for Girls in Kingston, a spokeswoman said the school was open, but that most teachers and students had not showed up. Alliman, who lives in Red Hills, St. Andrew, outside the city, wrote that he went out to give blood Tuesday, and "even well into the evening when I was returning home, I wasn't overly anxious about being on Red Hills Road, where a lot of shooting had been taking place only a couple days ago." Some restaurants on the road were still open as he was driving past about 6:30 or 7 p.m., he said. Alliman on Monday submitted an iReport photo taken from his balcony showing smoke rising from a fire in Kingston. He said he hadn't left home on Wednesday, but "at the very least I haven't heard any more gunshots from here." Violet Dias, an American citizen from New York, said Tuesday she was locked down in her home in Kingston's Tivoli Gardens neighborhood because of the violence. "They shot up the front of my house," she said. Police had taken her nephew and grandson for questioning, she said. "We did not have any [electricity] yesterday, but it came back. We have no food," she said. "We can't get anything to eat." Dias, an amputee and an asthmatic, is due to return to the United States on June 14, she said. The manager of a food distribution company said his business was weathering the upheaval and that things were "getting back to normal." "Right now it's pretty calm... But people -- especially yesterday -- mostly were cautious and taking the necessary precautions," he said by phone, asking that his name not be used. He said there's been a "mixed response" to the government's handling of the situation. But, he said, most people "want the security forces to do what they have to do."